from the U.S. Department of Housing and Urban Development (HUD) and the Alcohol, Drug Addiction and Mental Health Services (ADAMHS) Board for Montgomery County. 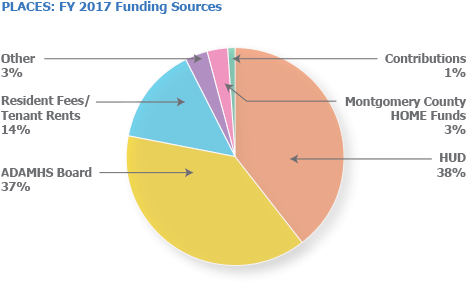 The remainder comes from resident fees and tenant rents, Montgomery County HOME funds, individual contributions and other sources such as grants from private and corporate foundations and other agencies. 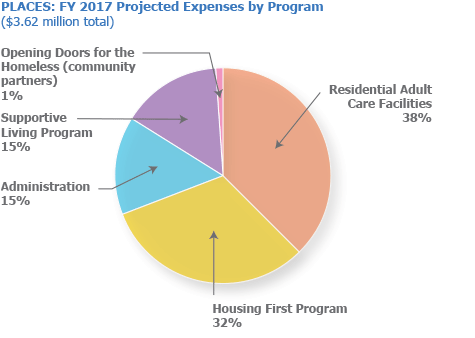 PLACES is a good steward of its funds: 86 percent of the projected expenses are for the three programs for residents, clients and tenants and for supportive services and housing provided by our community partners through the Opening Doors for the Homeless program.